Welcome back, SargeRho here once again. Continuing our onslaught of dev blogs, we’re going to look at our current plans for the resource system. Because the two Human factions, and the Alien faction have slightly different resources, this dev blog will have three sections: Common resources, Human resources and Alien resources. There are three common resources in the game: Metal, Hydrocarbons, and Salvage or Scrap. Metal and Hydrocarbons are used by all three factions to produce their units. Resource deposits are technically infinite, but they produce fewer resources as a function of time. Metal is mostly mined by building a miner on an Island. Metal is used to build units and structures, and produce ammunition. The TDN use a combo of giant jackhammers and a bucket wheel excavator for that, the CN a plasma lance that explodes bits out of the ground, and the Ravagers use a mining laser. Metal deposits tend to be considerably rarer than Hydrocarbon deposits, simply because Hydrocarbons are drained constantly by the human factions, while Ammo is both consumed slower, and requires more Hydrocarbons than Metal to be produced. Hydrocarbons are also used for the production of units, mostly being produced to make things like graphene electronics and photonics, plastics, and so on. They’re also used to produce fuel and ammunition. Though hydrocarbon deposits are much more abundant than metal deposits, they vary much more in concentration. Rich hydrocarbon deposits are rare, and thus priority targets. 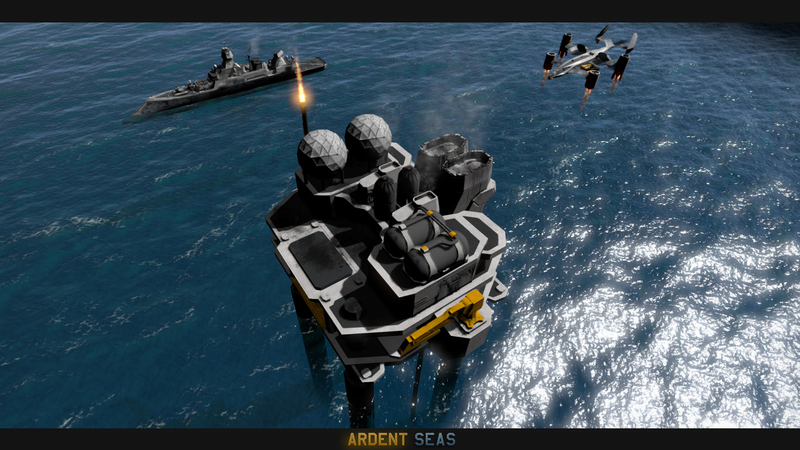 The TDN mines hydrocarbons with good old offshore drilling rigs, the CN, being the submarine-fanboys that they are, use deep sea mining rigs, and in the case of the Ravagers, it’s done by the Flagship itself, and by Auxiliary Command Ships. 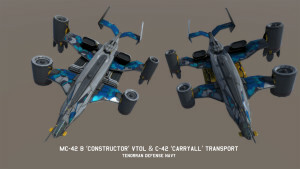 Usually, mined resources have to be carried to a resource drop-off, these are located either on Capital ships, like the Flagship itself, Supercarriers, and such, but also on islands that have enough space for a refinery complex, and of course, a refinery built on them. 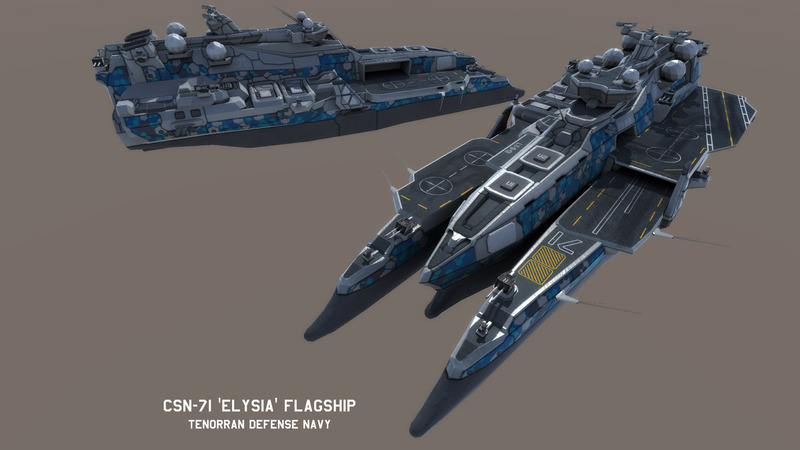 Another exception is the Ravager Flagship, which can mine Hydrocarbons by itself. As resource carriers, the TDN use the Carryall, the CN use a Freight Submarine, and the Ravagers an airborne freighter. The main reason to have these is to make economy harassment a viable strategy, even though the miners themselves are quite sturdy. 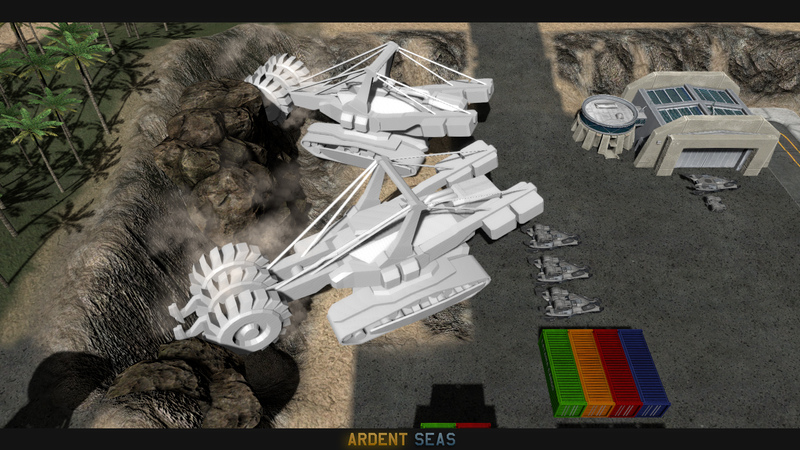 It is possible that we might scrap the resource carriers though, and make the mined materials just be magic’d onto the player reserves, is it turns out that this mechanic is too cumbersome. The next resource is Salvage. Sinking ships and shipwrecks can be picked apart by Combat Research Vessels, and quite gruesomely by the Ravagers’ Devourer, also active ships, to produce Salvage. Salvage is used to research new technologies and upgrades. It can only be derived in combat, and should provide quite a bit of motivation to blow stuff up, as if any was needed. RnD will be covered in a separate blog, so, moving on. Above, and in the last dev blog, we’ve already touched on Fuel and Ammunition a little, but not explained where they actually come from. For the purposes of this dev blog, we’re treating Human ammo and Ravager ammo as two entirely different kinds of resources. Ammunition is used by all units that have weapons other than CIWS, and is just one ammo hold per unit, so, the main guns and missile launchers of a Battleship both draw from the same pool. It’s produced from Hydrocarbons and some Metal, on a continuous basis, being slowly drained from the mined resources, and then distributed by replenishment ships, in the case of ships, and by carriers and airfields to aircraft. same goes for Fuel. Fuel is used by all non-capital ships, and is produced entirely from Hydrocarbons. 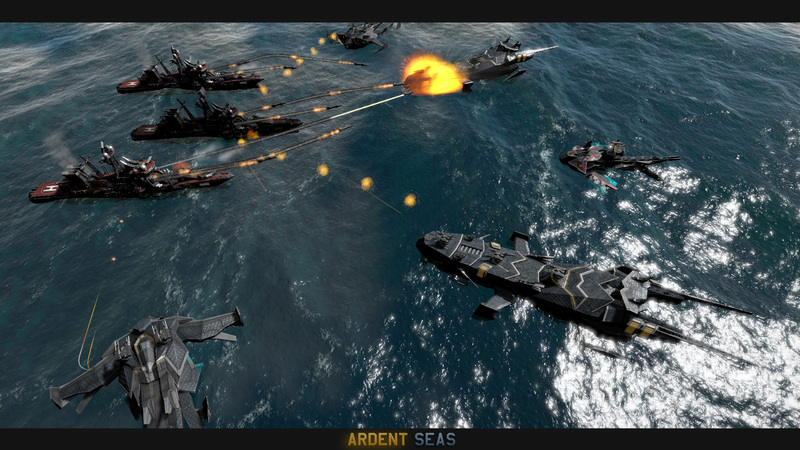 Finally, Human ships generate Experience in combat, and level up when they reach a certain amount, from normal to veteran, and then from veteran to elite. I’m not sure if I would call this a resource, but I think it deserves a mention. Power works very much like Fuel, but it’s only used by aircraft and ground units. Carrier units charge up aircraft assigned to them when they land, while ground units are charged via deployable energy transmitters. Because Ravager ships are all fusion-powered, they just draw all the fuel they need from the water. Oceans are full of Lithium and Boron, after all. Ammunition is generated by the ships themselves also, although aircraft still have to reload their ammo at their carriers. 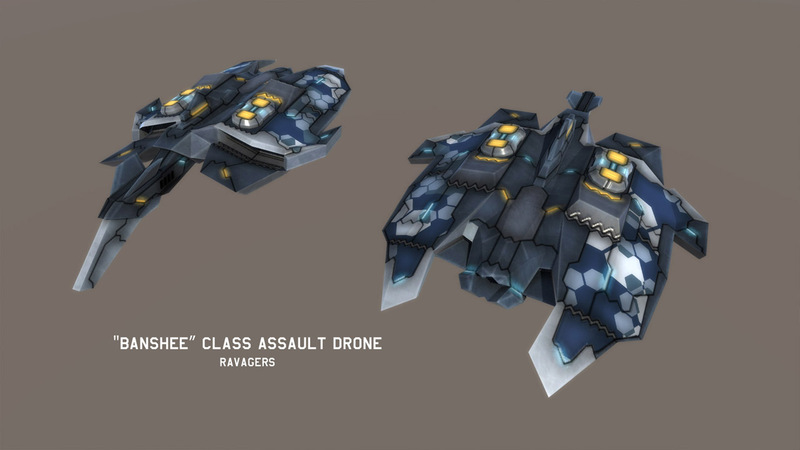 ground units mostly use directed energy weapons, and as such, only need power. In case of the Ravagers, it’s mostly to put some brakes on the pwn-train. Their ships are extremely powerful, but they will run through their ammo supply much faster than their Human counterparts. That should just about cover everything. If you have any questions, suggestions, or objections, put them in the comment section below, or let us know in the forums, twitter or on Facebook!